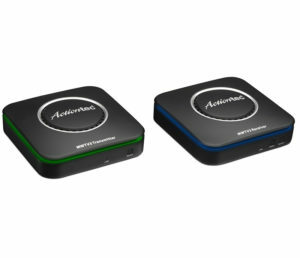 MyWirelessTV3 is Actiontec Electronics’ latest in wireless HD technology. It brings 4K resolution to your home for an immersive home theatre experience without wires. Watch your favorite entertainment in 4K resolution anywhere in your home. The MyWirelessTV3 kit wirelessly connects HDTVs to most HDMI cable/satellite set-top boxes, Blu-ray players, and consoles up to 150 feet away, even working through walls and floors. MyWirelessTV3 replaces unsightly HDMI cables with the convenience of wireless technology. It provides the flexibility to network your home exactly how you want, without investing in an expensive wiring project that involves running cables throughout your home. Hang a flat panel TV in the master bedroom, and connect another HDTV in the kid’s room and save the cost of ordering another set-top box or cable hookup. Mount a big-screen TV outdoors and extend the party to the patio. It is now available at Best Buy for $229.99.